In the Roman world, the responsibility for protecting civilization lay in the hands of one human being: the emperor of the Romans. All authority had been delegated to the emperor by God, and the legitimacy of all states, officials and armies emanated down from the imperial person and were thus subordinate to him as he was in turn subordinate to Christ. As the deacon Agapetos reminded Justinian, the latter had “been entrusted by God with the empire of the world." The basic nature of this authority was the emperor’s responsibility to maintain, uphold and protect Christian Roman civilization against enemies internal and external: from the internal with laws and from the external with armies and fortifications. The scholar-emperor Constantine Porphyrogennitos (913-959) encapsulates the awesome scope of the emperor’s responsibility in his account of the ritual prayer for urban protection the emperor made when leaving the capital city of Constantinople. When the emperor is a sufficient distance from the imperial harbor, so that he can look upon the City, he rises from his couch and stands looking eastwards with his hands raised to heaven; and making the sign of the Cross three times with his hand over the City, he prays to God and says: “Lord Jesus Christ, my God, I place in Your hands this Your city. Defend it from all enemies and misfortunes which approach it, from civil strife, and from the inroads of the heathen. Guard it impregnable and unassailable, for we place our hopes in You. You are the Lord of forgiveness and Father of compassion and God of every supplication, and Yours is the power of mercy and salvation and deliverance from temptation and dangers, now and always and forever more. Amen." In the absence of the emperor, only Christ could serve as a suitable custodian. 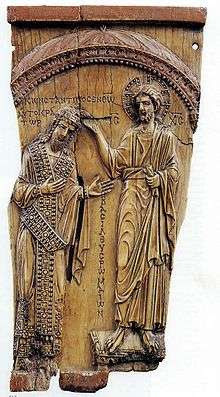 With the aid of bishops and priests, the emperor was believed to hold the power to place a city under divine protection. As the above prayer shows, only spiritual fortifications could be truly impregnable, and these the emperor promises. As the deacon Agapetos assured Justinian, “A citadel secured by unbreachable walls looks down on the enemies who besiege it. Your pious empire, walled by acts of charity with prayers for towers, becomes impregnable to the arrows of your foes.” The overall point was that the security was to be airtight, cocooning the cities of the empire from violence. Patronage of walls was one element of this responsibility.